When I'm looking for the perfect dress or top, I can't rely on their appearance. 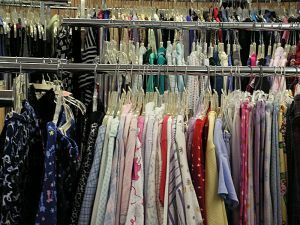 What seems like the ideal choice on the rack often brings disappointment or downright horror in the dressing room. By the same token, the items I've brought in on a whim or with little enthusiasm often become my favorites. 1) What will make my character more realistic? A collection of some kind? A love for a particular color or type of clothing? An endearing habit or favorite food? A passion for a cause? 2) What timeframe/setting will be the best vehicle for my story idea? Will it work as a contemporary, a historical, or a futuristic novel? 3) How can I use my own interests/hobbies to enrich my writing? I once switched the time period of my first manuscript to the present day. Or attempted this feat. It didn't work, but I'm glad I tried. The effort bolstered my confidence in my story and the direction it took. Now, I try on different scenarios like apparel. I recently snagged a great dress on a clearance rack. Who knows what treasures await as I explore my writing toolbox? Writers: Do you try what-if questions? Have you ever made your story take a detour or changed characters during the editing process? Let's discuss this in the comments. Readers: Do you ever get annoyed with a particular character in the books you read? Please share. I completely changed a character once, and then loved my short story so much better. Have agreat week Susan. My novels thrive on those what-if questions. Food for my work. Hi Linda - Those changes can make a manuscript sing. I added a whole subplot with a new character. It added to the conflict. Hi Wendy - Yes, what-if questions get the brain cells in gear. Yes, the what-if questions really help me imagine my characters. I ask things like, "What did like to study in high school or college? Hobbies? What are her family dynamics, family memories, favorite books and music. What hard things happened that might have contributed to the way she reacts to other people or situations. Good stuff, Susan! I do use what-if type questions sometimes. And yes, I do get annoyed with characters. Read a book recently where the character was just plain whiny. I didn't finish it. Yes! I definitely try those what-if questions. It's usually before I start my first draft but there are always those moments during writing that I have to shift course and ask again to make the plot more interesting or feasible. Hi Dena - Like you, I find asking questions helpful. Hi Karen - Hmm, whiny isn't good. Neither is wimpy. Hi Cindy - I also like a character to grow. Maybe she's a bit fearful and then faces her fears. Your comment showed up twice. Having Blogger problems? I do try some of those "what if" questions. I like the idea that writing a book is like trying on clothing. You won't get the perfect ensemble unless we try on the clothes. I'm not so good at the "what if" questions, I usually need to start writing in order to imagine different scenarios, but I do like to give my characters a unique trait - like favorite foods, hobbies, etc. And I love your clothing comparison, Susan! So true for both shopping and writing! So nice to hear from all of you! Thanks for stopping by and commenting. Hi Melanie - I have that craft book. It's excellent. Hi Loree - A lot of that "trying on" happens in the editing process. I've even seen fashion gurus refer to cleaning out your closet as "editing." Hi Debra - I think it gets easier as you practice.